The schematic diagram of the inverter is as shown in Figure. 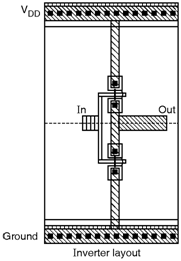 The stick diagram of the schematic shown in Figure. Here, the most important point to note is that as we change the placing of the components in the schematic the stick diagram and hence, the layout of the circuit will change accordingly. For example, if we place the components vertically the stick diagram will be vertical and if we place the components horizontally the stick diagram will be horizontal. 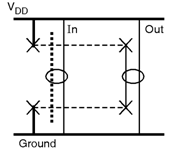 Figure below shows the physical layout of inverter which is drawn in tanner tool.